Conference 2004 28th biannual Conference, 4th covered by the anvilfire NEWS. With over 200 photos this had been a record setting edition of the NEWS! Now we have added dozens more from the ABANA gallery photographed by Shane Curfman. Our 4th Conference! In 1998 when anvilfire was only months old we covered the ABANA conference in Asheville, NC and we participated in the East Coast vs. West Coast JYH event. Over the past 7 years to cover the NEWS for anvilfire I have traveled to several ABANA conferences, CanIron and many of the local/regional conferences such as BGoP's Spring Fling, the AFC converence and the Southeastern Regional Conference. In 2000 Wallace Metal Work sponsored our conference attendance. This year Big BLU Hammers is paying our way. They are also bringing Uri Hofi to demonstrate the Big BLU! Conference Richmond, KY - Eastern Kentucky University Campus. It is only setup day yet a few vendors had demonstrations going on. Bob Bergman of Old World Anvils and KA Hammers demonstrated the KA hammer, Jere Kirkpatrick demonstrated his treadle hammers and the Henrob torch, and Uri Hofi demonstrated forging on the BigBLU using his system of crown dies. Uri held several demonstrations for capacity crowds. The official demonstrations started today as well as opening of the teaching station where you could get lessons from the likes of Peter Ross of Williamsburg. Under a blistering heat there was also full attendence at the Big Blu tent where Uri Hofi was demonstrating. His demonstrations ran under 10 pm last night and will do so again Friday. Steven Bondi succumbed after a long illness and will be missed by family and friends alike. I met Steven two years ago when he would often come by my shop and graciously share his knowledge and expertise. He had a sharp wit and a dry humor that I enjoyed whenever he was around. He was a champion of Blacksmithing and traveled extensively to study and photograph ironwork. 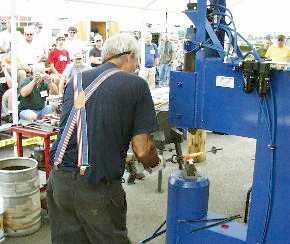 The Blacksmithing community has lost a truly remarkable member. Daniel Cerny, Gert Bruyninx and Jan Stanek The hardest working and least appreciated demonstrators at the conference. Continued . . .
Uri Hofi with the results of four days of demos using the Big BLU. THE CONFERENCE: Started Tuesday night with a heavy rain storm and ended Saturday night with a heavy rain storm. In between it was miserably hot and humid, typical for summer time in most of the Central and Southern US. Although it seemed well organized the conference facilities were much too spread out for some of us. The quarter mile hike and three flights of stairs to the cafeteria was too much for many of us in this weather. Although there was a scheduled bus I found many people waiting half hour or more in the merciless sun. The University (or ABANA) probably made out like a bandit on undelivered meals. I had a meal ticket for convienience but only used it once. Many others did the same. It is time that ABANA start looking for indoor venues such as the coliseums where monster car shows are put on. If these places air handling systems can take monster truck exhust and show pyrotectnics then they could take a little coal smoke. As in the past many of the demonstrations were much too long and slow to enjoy. In the large tents all one could see is a piece of hot metal and something being done to it. Things we missed: Due to things being so spread out we missed many things. I had one chance to visit the indoor vendors after dinner one evening but they were closing down. I tried the gallery once (mid day) but it was closed. After a long day in the sun and with work to do I missed the evening events such as the Albert Paley slide show. To cover this size event and post on it in a timely fashion requires more than one person. SAFETY at the CONFERENCE: A number of folks have commented on this and also I noticed it. This was the first ABANA conference I have been to that the safety folks were not making sure EVERY demonstrator wore safety glasses all the time. 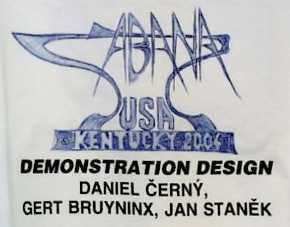 In the past they have been known to remove people from ABANA and their demonstrator's list if they were caught demonstrating without safety glasses. In Flagstaff I was thrown out of the teaching station while trying to take some photographs. This year the only time a station boss suggested safety glasses was during some forge welding in the Czech tent (where the demonstrators were not wearing safety glasses). Going through my photos I found most of the American demonstrators using safety glasses but many of the Europeans were not. . .